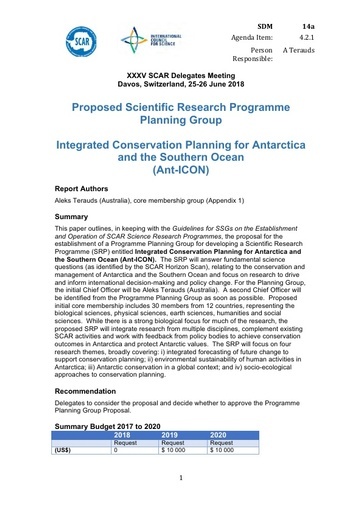 This paper outlines, in keeping with the Guidelines for SSGs on the Establishment and Operation of SCAR Science Research Programmes, the proposal for the establishment of a Programme Planning Group for developing a Scientific Research Programme (SRP) entitled Integrated Conservation Planning for Antarctica and the Southern Ocean (Ant-ICON).The SRP will answer fundamental science questions (as identified by the SCAR Horizon Scan), relating to the conservation and management of Antarctica and the Southern Ocean and focus on research to drive and inform international decision-making and policy change. For the Planning Group, the initial Chief Officer will be Aleks Terauds (Australia). A second Chief Officer will be identified from the Programme Planning Group as soon as possible. Proposed initial core membership includes 30 members from 12 countries, representing the biological sciences, physical sciences, earth sciences, humanities and social sciences. While there is a strong biological focus for much of the research, the proposed SRP will integrate research from multiple disciplines, complement existing SCAR activities and work with feedback from policy bodies to achieve conservation outcomes in Antarctica and protect Antarctic values. The SRP will focus on four research themes, broadly covering: i) integrated forecasting of future change to support conservation planning; ii) environmental sustainability of human activities in Antarctica; iii) Antarctic conservation in a global context; and iv) socio-ecological approaches to conservation planning. Delegates to consider the proposal and decide whether to approve the Programme Planning Group Proposal.